Really shows how far special effects have advanced in recent years given how much takes place in broad daylight. Also, a good balance between focus on story, focus on characters, and focus on action. Technology is very well done. Great music by M83. One thing I liked a lot better than some other recent sci-fi/fantasy spectacles: there’s not as much blowing-things-up-real-good here. Yes there are battles but not the kind that require skyscrapers to fall and streets to be filled with rubble and fleeing multitudes. I’m getting really tired of that which was one of the reasons that I found The Avengers so boring. Back to the images: the film is gorgeous. 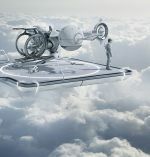 The technology is appealing and the living quarters above the clouds are evocative. The lighting in this film is superb. Plot holes are plenty but, as noted, this is a popcorn movie. I’ll also have to admit that I am a Tom Cruise fan. As politically correct as it is to tear him down, he works really really hard at what he does and it shows, whether we’re talking Oblivion, Mission Impossible, or Valkyrie. Finally, a word of warning: I saw this in an IMAX theater and boy it is LOUD. The bass is just incredible and reminded me of my seeing Contact for the first time in Los Angeles; the theater shakes. You may find yourself covering your ears at times (not that that helps). Review copyright (c) 2013 by Dennis D. McDonald. To see more of my movie reviews go here.